This property enjoys a convenient location near both the shopping district and the business districts. The Helsinki Cathedral, Market Square, and Old Market Hall are some of the popular landmarks that can be found less than a kilometer away from the Hotel Seurahuone Helsinki. Art lovers will find two galleries – the Ateneum Art Museum and the Museum of Contemporary Art – just a short distance from this Helsinki hotel. 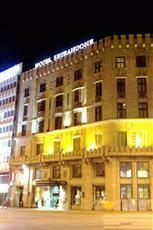 The railway station is located right across the street from the Hotel Seurahuone Helsinki. This first class hotel contains 118 rooms and 5 suites. Satellite TV, tea/coffee making facilities, mini-bars, and safes are some of the features available in all of the Hotel Seurahuone Helsinki’s rooms. The Hotel Seurahuone Helsinki is a stylish property that combines 150 year old traditions with a selection of modern amenities. The on-site restaurant was designed by Armas Lindgren in 1914 and serves up a variety of delicious international entrees. The glass-domed lobby bar, which is decorated with chandeliers and dark wood furnishings, provides the perfect place to relax with a drink after a long day.